The Color of Salmon: How Much Would You Pay for Orange? The color of food plays a perhaps surprisingly large role in our perceptions of its attractiveness, as well as our expectations of how it will taste. Take salmon, for example. Studies have shown, and salmon prices reflect, our inherent bias and preference for salmon that is orange to reddish in color. Wild salmon flesh ranges in color from pink to orange-red. 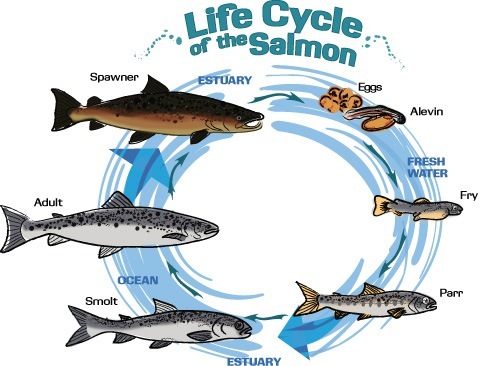 Exactly where the flesh of any particular salmon – sockeye, Coho, King or pink – falls on the color scale depends on the amount of reddish-orange chemical compounds – carotenoid pigments – the salmon ingests. The more astaxanthin-containing shrimp and krill a wild salmon eats, for instance, the more orange to reddish the color of its flesh will be. Farmed salmon, on the other hand, are fed pellets typically made up of a mix of cheap grain-based feed and oils, from crops such as soybeans, as well as varying amounts of ground-up fish meal and fish oils. Without supplementing their diets or dyeing their flesh after harvesting, farmed salmon would be grayish in color, a definite turn-off for us human consumers. And it turns out that salmon farmers, as well as some consumers, are willing to pay quite a bit more for salmon that's orange to reddish in color. But market prices don't reflect the overall costs of giving farmed salmon this more attractive hue. In nature, astaxanthin is produced by microscopic algae that are consumed by shrimp, krill and other crustaceans. These animals, in turn, are consumed by salmon and other animals – think: pink flamingos. In this way, the carotenoid pigment and its antioxidant properties makes its way up and around the food web. The range of color we find in the genera and species of wild salmon varies with the amount of astaxanthin contained in their prey. With feeding grounds in the krill-rich Bering Sea, Alaska’s sockeye salmon, for instance, tend to be the most reddish in color. Consuming less in the way of shrimp, krill and other small crustaceans, Coho, King and pink salmon, on the other hand, tend to take on a lighter orange color. The sensory signals orange and red pigmentation trigger in our nervous systems go far deeper than visual appeal. It turns out that astaxanthin and canthaxanthin, like other antioxidants, help protect our nervous systems from toxins, cope with stress and stay healthy. They also help keep our joints and skeletal systems strong and flexible. So besides the visual appeal of their orange to reddish color, it turns out that wild salmon flesh is also more nutritious. Some consumers are willing to pay a considerable premium for wild-caught salmon. In fish markets, wild-caught salmon can cost “two to three times as much as farmed salmon (which is usually $6 to $10 per pound ... [and] serves as the aesthetic standard as well,” Gwynn Guilford points out in a March 2015 article in the Atlantic. As Guilford highlights in the Atlantic, pigment supplements can make up 20 percent of farmed salmon feed costs -- making them the single costliest ingredient in a salmon farm's operating budget. The higher prices they command more than offset the higher costs, however, making it attractive for salmon farmers to keep doing so. Overfishing of wild salmon to the point of near annihilation is what led to development and growth of salmon aquaculture and farms in the first place. But as Guilford writes: “The fact that consumers will shell out more for salmon that looks wild – even if it got that way by eating pellets in its pen – hints that people want to be eating wild salmon, but not quite badly enough to buy the real deal.